Hitler rapidly transformed the Weimar Republic into a dictatorship. The National Socialists accomplished their “revolution” within months, using a combination of legal procedure, persuasion, and terror. Because the parties forming the cabinet did not have a parliamentary majority, Hindenburg called for the dissolution of the Reichstag and set March 5, 1933, as the date for new elections. A week before election day, the Reichstag building was destroyed by fire. The Nazis blamed the fire on the Communists, and on February 28 the president, invoking Article 48 of the constitution, signed a decree that granted the Nazis the right to quash the political opposition. Authorized by the decree, the SA arrested or intimidated Socialists and Communists. Hitler used the Enabling Act to implement Gleichschaltung (synchronization), that is, the policy of subordinating all institutions and organizations to Nazi control. First, left-wing political parties were banned; then, in July 1933, Germany was declared a one-party state. The civil service and judiciary were purged of “non-Aryans” (Jews) and leftists. 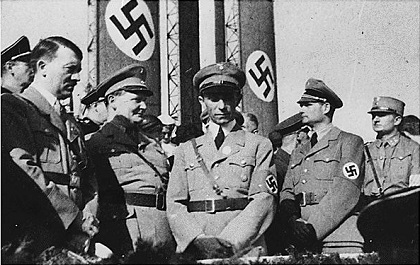 Local and state governments were reorganized and staffed with Nazis. Trade unions were dissolved and replaced with Nazi organizations. 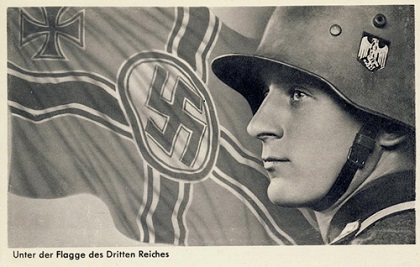 Even the NSDAP was purged of its social-revolutionary wing, the SA. The enormous and unruly SA was brought under control by a massacre of its leadership at the end of June 1934 in the “night of the long knives.” Other opponents were also killed during this purge, among them Schleicher. After Hindenburg’s death in early August 1934, Hitler combined the offices of the president and the chancellor. With the SA tamed, Hitler assured the army that he regarded it as Germany’s military force, and the soldiers swore an oath of personal allegiance to Hitler, pledging unconditional obedience. Heinrich Himmler’s Guard Detachment (Schutz-Staffel–SS) replaced the SA as Hitler’s private army. Once the regime was established, terror was the principal means used to maintain its control of Germany. Police arrests, which had focused originally on Communists and Socialists, were extended to other groups, most particularly to Jews. This systematic use of terror was highly effective in silencing resistance. Some enemies of the regime fled abroad. However, all but a tiny minority of those opposed to Hitler resigned themselves to suppressing their opinions in public and hoping for the regime’s eventual demise. Like its secular institutions, Germany’s churches were subjected to Nazi pressure. They resisted incorporation into the regime and retained a substantial degree of independence. This situation was tolerated by the regime, provided that the churches did not interfere with its efforts to control public life. When the churches were outraged by such Nazi practices as euthanasia, they protested. The regime responded by more carefully concealing such medical procedures. Otherwise, with the exception of a few brave isolated clergymen, the churches rarely spoke out against the regime. The regime’s chief victims–Jews, Communists, Socialists, labor leaders, and writers–generally had not been close to the churches, and their persecution was witnessed in silence. 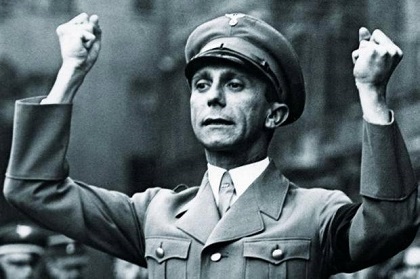 Joseph Goebbels, the minister of propaganda, contributed to the regime’s consolidation with the establishment of the Reich Cultural Chamber, which extended Gleichschaltung to the educational system, the radio, and the cultural institutions. However, an elaborate system of censorship was not considered necessary to control the press. Non-Nazi party newspapers had already been suppressed. The editors of the remaining newspapers soon were able to figure out what was deemed suitable for public consumption. Goebbels also took an interest in Germany’s substantial film industry, pressuring it to make pleasant, amusing films that would distract the German public in its leisure hours. The regime soon achieved its desired consolidation. Many Germans supported it, some out of opportunism, some because they liked certain aspects of it such as full employment, which was quickly achieved. 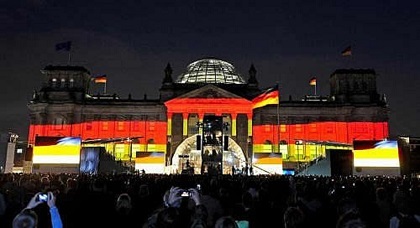 The regime also brought social order, something many Germans welcomed after fifteen years of political and economic chaos. Many were won over by Hitler’s diplomatic successes, which began soon after he came to power and continued through the 1930s and which seemed to restore Germany to what they saw as its rightful place in the international community.